In the cannabis industry, no day holds quite as much significance as 4/20, both culturally and economically. This report offers a look at the 4/20 effect on cannabis sales for each of the past three years, as well as insights about what to expect this year, when 4/20 falls on a Friday for the first time. Will it be one long weekend? Read it to find insights about the most popular products, pricing and discounts, the demographics of 4/20, and more. That 4/20, the cannabis world’s unofficial holiday, is also a major sales boost for the legal cannabis industry should surprise no one. Our data bears out that narrative, placing 4/20 above Weed Wednesday (the day before Thanksgiving) and other cannabis-themed holidays in terms of its effect on sales. 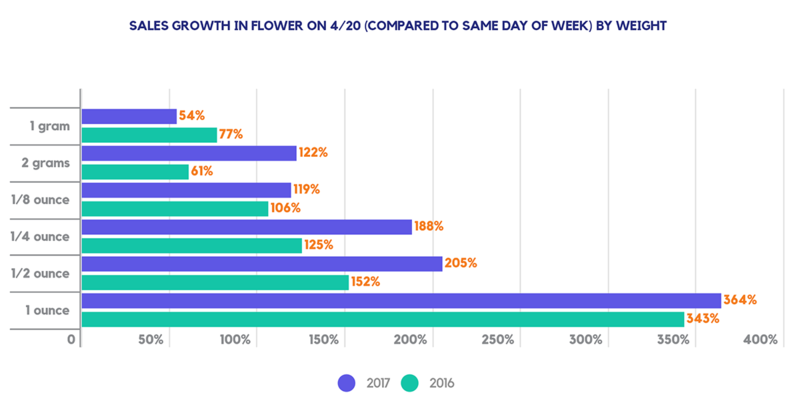 In this report, we’ve examined the last three years of 4/20 sales data, as well as three years of data for the same days one week prior and one week after 4/20. Of course, we’ve looked at who comes in on 4/20 and what they spend. It turns out that Millennials, who are typically frequent purchasers but not big spenders, open their pocketbooks a little wider for 4/20. We’ve also looked at what specific products do well on 4/20: It’s heavily weighted towards single-serving items, as you might expect, although not always in the size you’d think. We’ve also learned that loyalty programs play a role in 4/20 sales, which should be useful information for anyone who works in retail. Most interestingly, we’ve looked at pricing and discounts for 4/20, and noticed that people still buy a lot of pot even if it isn’t deeply discounted. Our data shows that consumer participation in the holiday seems to be driven more by enthusiasm for cannabis and the legalization movement than bargain hunting, which speaks to the unique nature of the cannabis consumer base. Also, this year’s 4/20 is on a Friday for the first time, which could change everything. While a sales boost is almost guaranteed, it could be softened by the already occurring Friday sales boost, when more casual consumers come in to fuel their weekend adventures. Or, given that cannabis lovers can let loose and not worry about working the next day, it could fuel sales even more. Either way, 4/20 data is always a fun read. While plenty of other consumer industries try to foist made-up holidays (Negroni Week, anyone?) on their customers, 4/20 is the opposite of that. It grew organically out of the cannabis movement, and is an integral part of cannabis culture. Looking at the specific ways this enthusiasm plays out in sales has a lot to tell us! Data for this report comes from real-time sales reporting by participating Washington State cannabis retailers via their point-of-sale systems, which are linked up with Headset’s business analytics software. This report is based on data collected from retailers on and around 4/20 in 2015, 2016, and 2017. 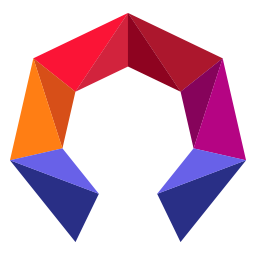 That data is cross-referenced with our catalog of over 250,000 products to provide detailed information on market trends. Small packages make up the bulk of sales on most days, and that remains true on 4/20. On a typical day, packages smaller than an eighth make up 77% of total flower sales. On 4/20, small packages still make up the bulk of sales, but they don’t see the most dramatic sales gains. 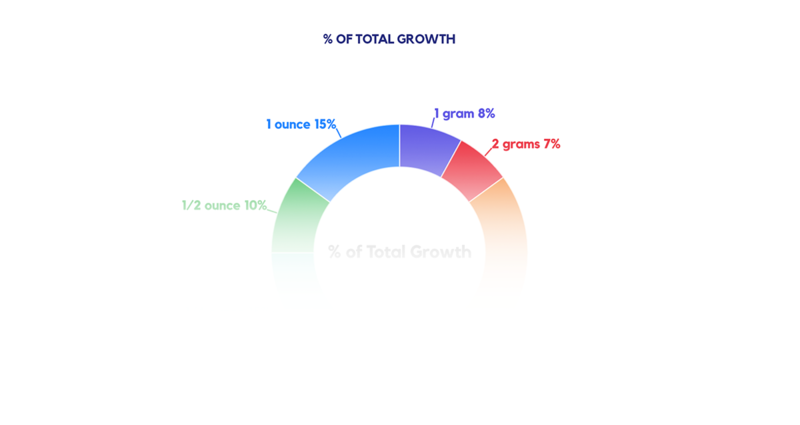 Two gram packages and eighths see over 100% and over 50% boosts in sales, respectively, but larger packages actually gain more. Ounce packages saw an increase of over 300%, while half-ounce packages were over 200%. The single-serving edible category (10mg) also shows notable sales growth, with a 350% increase over normal days. Small edibles are often added to baskets as an impulse purchase, and the 4/20 festivities could be adding to that effect. The fact that large packages see significant 4/20 sales lifts suggests that die-hard cannabis enthusiasts are stocking up for the big day, probably to the celebrate with friends. This fits with the idea of 4/20 as a social celebration of cannabis.